The cover of this tome displays the alchemic glyph of the mystic unity of creation, while the interior holds a wealth of secrets. The Dees Book of Angel Magic Stash Ring makes a perfect place to hide your secrets, too. Shaped like a book, the ring face features stunning brass inlay that contrasts the fine English pewter finish beautifully. The hinged sides allow the ring to open, revealing an interior hollow for personal use and storage. The ring also has a magnetic catch so it stays closed while worn. 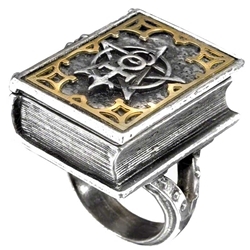 Masters of magic and alchemy will find that Dees Book of Angel Magic Stash Ring adds a touch of mysticism and mystery to their look, while also giving them a place to store all sorts of trinkets on their person.